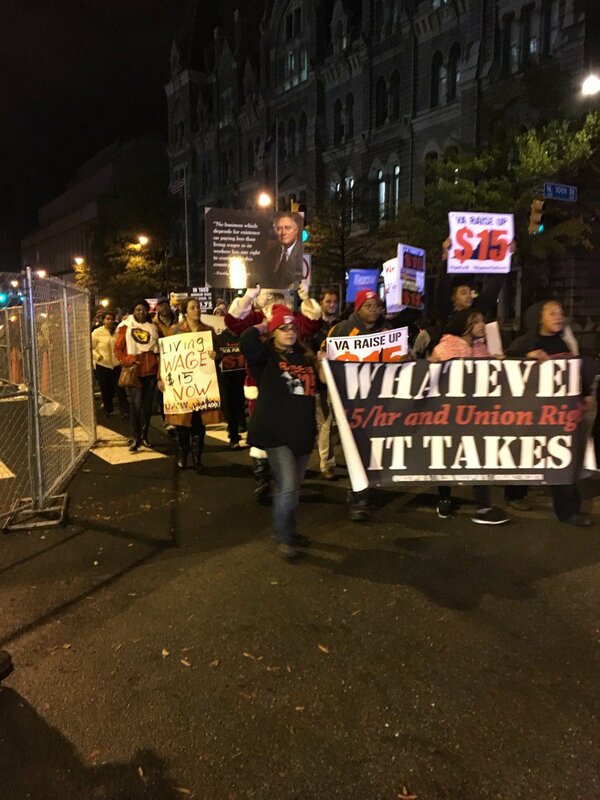 A wave of strikes and protests by low-wage workers fighting for a $15 minimum hourly wage and a union swept the U.S. on Nov. 10, and made this the largest day of action ever as this movement enters its third year. 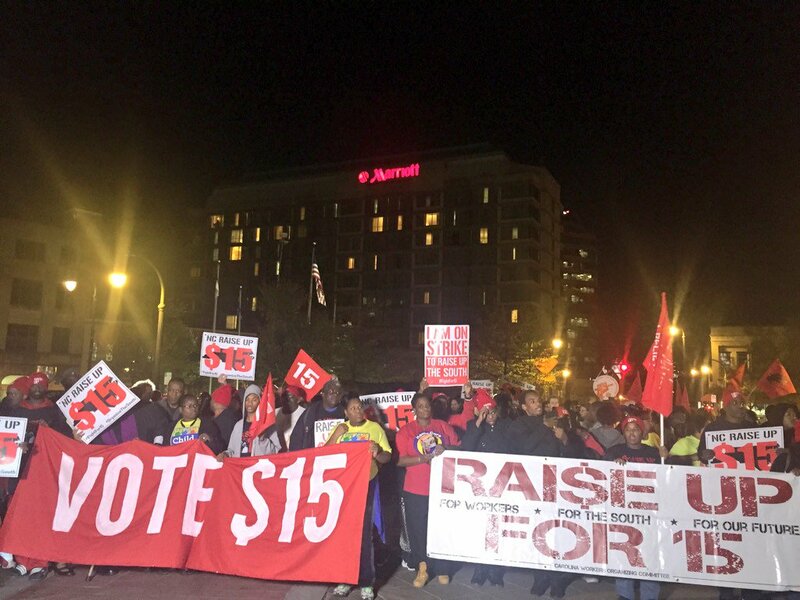 From Boston to Los Angeles; Seattle to Chicago; New York to Durham, N.C.; and Philadelphia to Atlanta, nearly every major city saw strikes at fast food restaurants during the work day and larger demonstrations in the evening. In total, some 500 cities counted strikes and other actions throughout the day. 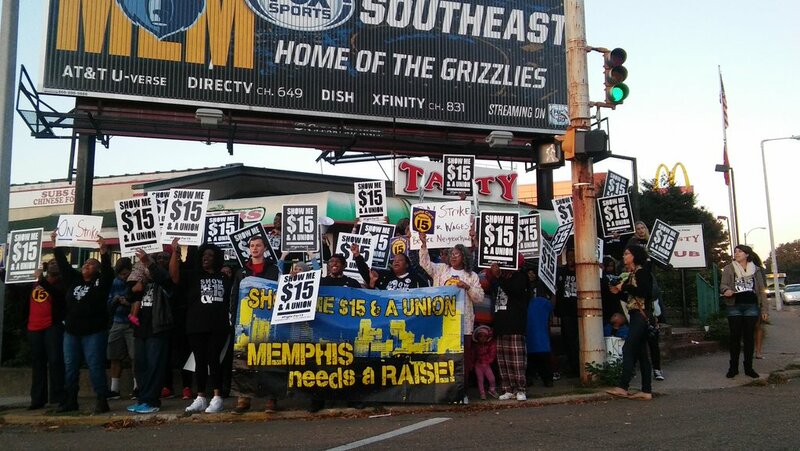 Fast food, home health care, childcare, airport, retail and low-wage workers from many other sectors took to the streets to raise their demands for $15 and a union. 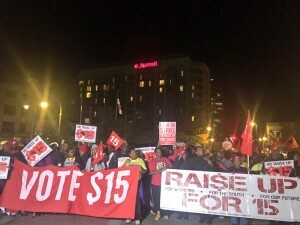 What began in November 2012 with a group of fast food workers in New York City who walked off the job has since sparked a national movement that has become a rallying cry for workers everywhere. An encouraging development with the latest round of strikes is the growing alliance between the Black Lives Matter movement, the immigrants’ rights movement, and the fight for 15 and a union. In many cities, visible contingents were organized by Black Lives Matter and immigrant rights activists within the demonstrations, and many speakers raised the connection between the low-wage workers struggle and the fight against racism and police terror. On the same day, a demonstration of many thousands confronted the Republican presidential candidates’ debate in Milwaukee. The demonstration raised the demand for $15 and a union, to end racism and police violence against oppressed communities, to stop deportations of immigrant workers, and many other issues. Nate Hamilton, the brother of Dontre Hamilton, who was murdered by the Milwaukee police, was a featured speaker at the demonstration. 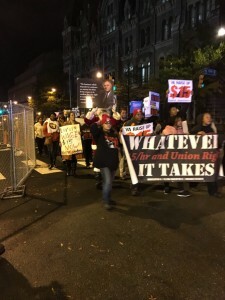 Most of the demonstrations around the country on Nov. 10 ended with protests outside of city halls, with calls for the elected politicians — who represent the bosses and their interests — to take action around the demands for $15 and a union. A key question for this movement — an upsurge that has been marked by militancy and the leadership of Black and Latino/a workers, along with many women and young workers — will be whether it will maintain its independence and build rank-and-file democratic union organizations in the face of the looming 2016 presidential elections. Without rank-and-file democratic organization and political independence, these elections tend to influence the main character of the workers struggles of mobilizing workers power eventually pulling popular movements away from strikes and street action, which is what is needed, into the framework set by the two major political parties, both of which represent the interests of the big capitalists and bankers. The courageous actions by low-wage workers, who have gone on strike multiple times in the last several years and have helped breathe new life into the U.S. labor movement, clearly demonstrate their commitment to staying the course and seeing this struggle through. That these workers are now broadening relationships with the Black Lives Matter movement and others indicates a new potential for this movement to expand and deepen. Tying the workers of this movement in the US South to a strategy to the developing strategy of the Southern Workers Assembly’s to organize a Southern Labor Congress, is critical to infusing social movement unionism as a perspective for organizing the working-class throughout the South. On Tuesday, November 10, members of the UE local 150, North Carolina Public Service Workers Union that work at Caswell Developmental Center held a rally at Kinston City Hall, joining with over 500 such actions nationwide. The action called for wages of at least $15 per hour, union rights and the recognition that Black Workers Lives Matter. Department of Health and Human Services workers and other state and city workers support striking fast food, child care and other low wage workers and are organizing for the same issues at their workplaces. A majority of front-line D.H.H.S. employees currently make less than $15 per hour, even those working with the state over 20 years. $15 per hour for a full-time worker is just over $30, 000 per year. 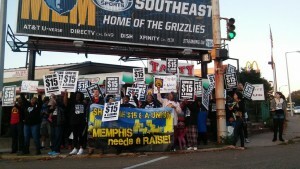 Price and her fellow workers called for a $15-per-hour minimum wage and proper pay for overtime instead of comp time. 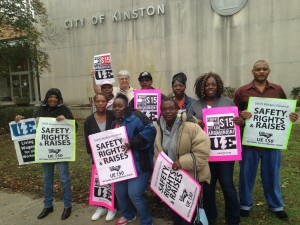 The union workers at the Kinston rally were specifically calling for all pay scales to be increased to at least $15 per hour. They called for state, city and all levels of government to pay workers a living wage. Currently, employees at many DHHS facilities do not get paid for overtime, despite being forced to work hundreds of hours of overtime every year due to understaffing. The rally demanded payments for overtime work, not compensatory time because workers, their communities and the Kinston economy are losing hundreds of thousands of dollars annually from this policy. The rally had a third demand which centered around the national movement calling for an end to police killings, most commonly known as Black Lives Matter. Recent uprisings in Baltimore, M.D. and Ferguson, M.O. have drawn international attention to the disproportionate number of Black people killed by law enforcement. The workers at the rally support the demand for justice for those killed by police, but are also extending the demands into their work places saying that “Black Workers Lives Matter too!” They are demanding the DHHS facilities hire enough staff and provide proper equipment to reduce injuries in Black-majority jobs. Simultaneous as the Kinston rally, there were other rallies in rural eastern N.C. Over 35 people picketed and rallied at City of Greenville City Hall. The rally included fast food workers, adjunct professors at nearby universities, public workers and the Pitt County Coalition Against Racism. 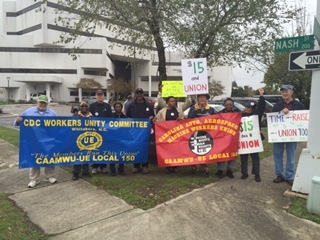 A rally in Rocky Mount included CAAMWU-UE 150 and laid off Tri County worker from Cummins Rocky Mount Engine Plant and call for rehiring Tri-County workers who petitioned for pay raise and were replaced by higher paid Insource workers. Later that night, nearly 400 people rallied and marched through the streets of Durham, concluding at the City Hall. 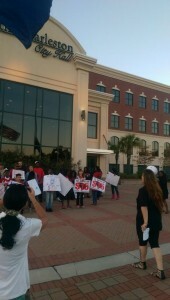 Marchers included UE150 members that work for the City, Central Regional Hospital and Murdoch Center. All rallies called for $15 per hour and union rights for all workers and to support Black Lives Matter. In N.C., the City of Greensboro recently adopted a commitment to raise all municipal workers’ salaries to $15 per hour over the next few years. This is a growing trend across the state, U.S. South and entire nation – Birmingham, A.L. also passed a similar ordinance, following on the heels of Seattle, Los Angeles, Oakland, New York and many other areas.